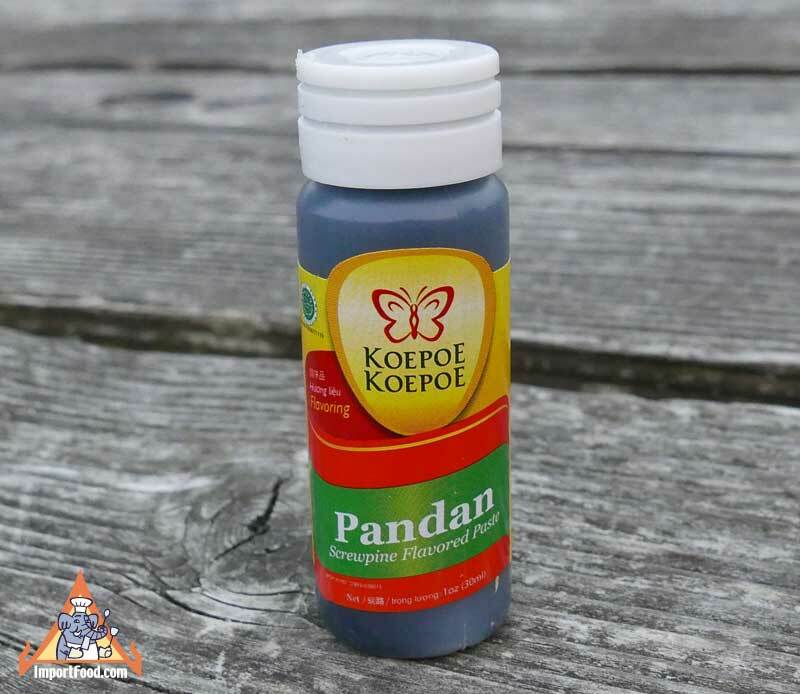 Pandan essence, also known as pandanus extract or screwpine paste, is delightful scent that's used throughout SE Asia especially Thailand. Pandanus leaves (in Thai "bai toey") are often soaked in water and boiled to extract both the green color, a natural food colorant, as well as the aroma which is a bit nutty and reminiscent of freshly-cooked jasmine rice. Often rice is flavored with pandanus essence and coconut milk to create various desserts such as crystal sticky rice & pandan custard. Rice or meat is also wrapped in pandan leaves and cooked--the wrappers providing added taste. Since the leaves are not commonly available in USA, and once dried there is a total loss of fragrance, many cooks prefer to use essence such as this product. Only a few drops are needed, this is a generous size. See our sample recipe Thai Rice Balls in Coconut Milk, "Bua Loi". Also found in Sticky Rice Steeped in Coconut Milk, "Khao Neeo Moon", and the Indonesian delight: Nasi Kuning, Festive Yellow Rice. A common sauce served with Thai donuts also. We also offer Jasmine flavor. See our fresh pandan leaves. This is a nice large bottle for generous use, 1 oz. Ingredients: Propylene glycol, ethylene alcohol, water, pandan flavor (natural and artificial), artificial color. Product of Indonesia. Pandan leaf, pictured above. The leaves are about 3 feet long and fairly skinny. Strong leaves are not only used for cooking--they're often used for construction of baskets and thatched objects.